North America Forum»Forum ›League of Angels-Fi... ›Strategy › The Ultimate Wharf guide to all players! The Ultimate Wharf guide to all players! The Ultimate Wharf guide to Guild Leaders and Members! Hello Guys! SGAlcheon here from S6 Nightblade I will be posting Strategies and guides along with the videos from the famous Hihaos, my friend, to give you guys the best guides with visuals and text. In this very post, I will be sharing my knowledge about the Guild Wharf with you guys!! Guild Wharf, Basically also known as Guild wars in games where guilds from different server vie to become champions in order to fight the boss to get bountiful rewards! 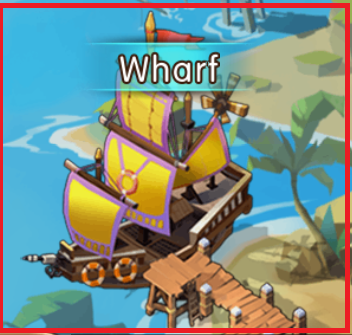 The Wharf is located inside of your Guild Tab. It is the ship located on the left which requires you to be level 22 in order to use it. 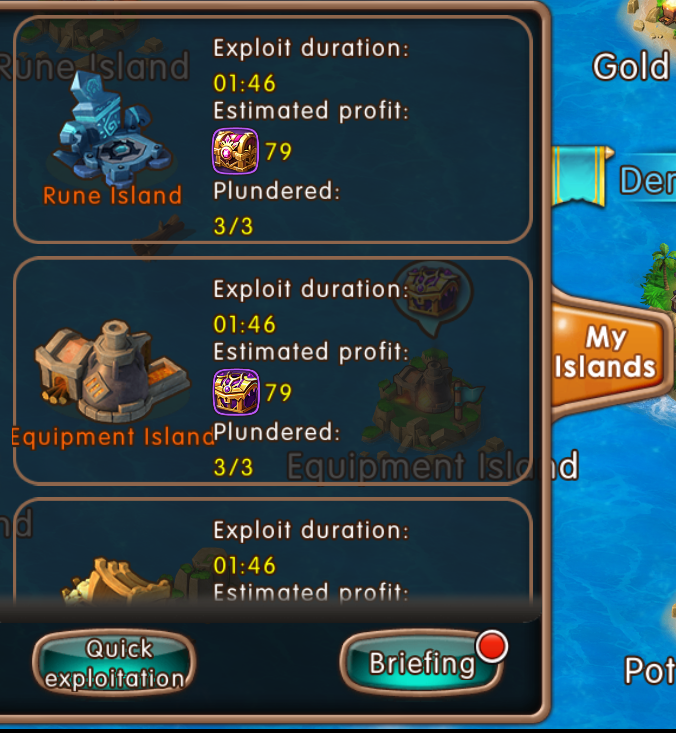 “Exploits” is what we call looting in the guild wharf, There are two ways to obtain devotion points, when you do exploit, or plunder others, you will get devotion points which is counted as the overall score to win the war. Now that you’ve learnt a little about exploits, where do you earn those points? From here you can select to farm 3,6, or 12 hours, and the reward varies, the more hours the more reward in 1 turn. However if you were to do 3 hours * 4, totalling up to 12 hours, the amount of items you get would be more as compared to the 1-shot 12 hour exploit. 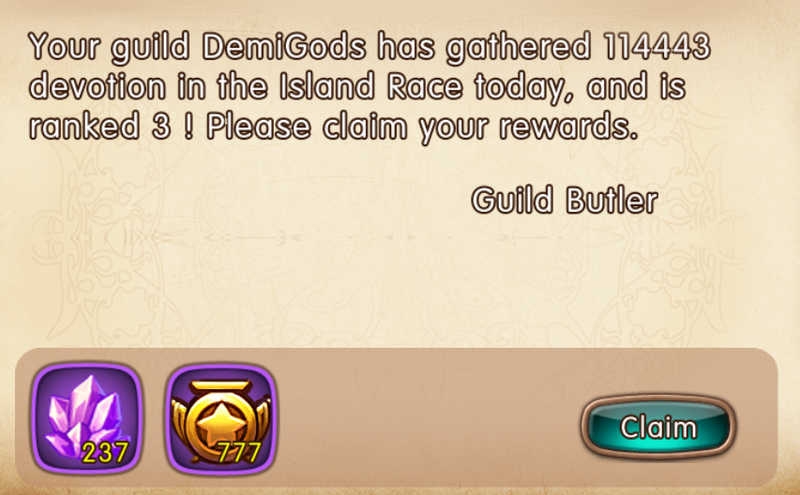 The next way to get more points for your guild is via plundering. Plundering is basically attacking your enemies in order to take their loots. By winning a plunder and looting them, it decreases their rewards and in turn, you also get the specific reward chest you raided and of course devotion points. You are able to attack 6 chance if you are below VIP 4. At VIP 4 you get 8 chance with 4 buyable chance VIP6 you get 10 chances with the opportunity to buy 6 buyable chances. 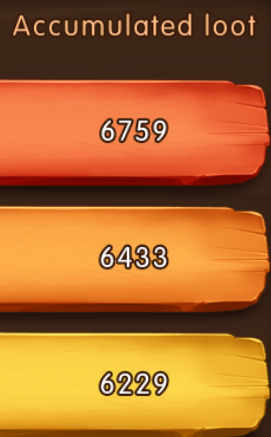 Do note that buyable chance are very good at gaining more devo battle points during times where guildwars are tough and close, every little point helps your guild in getting the first place! Defense is the defending units/teams for your loot island, all 4 loot island share the same defense team. 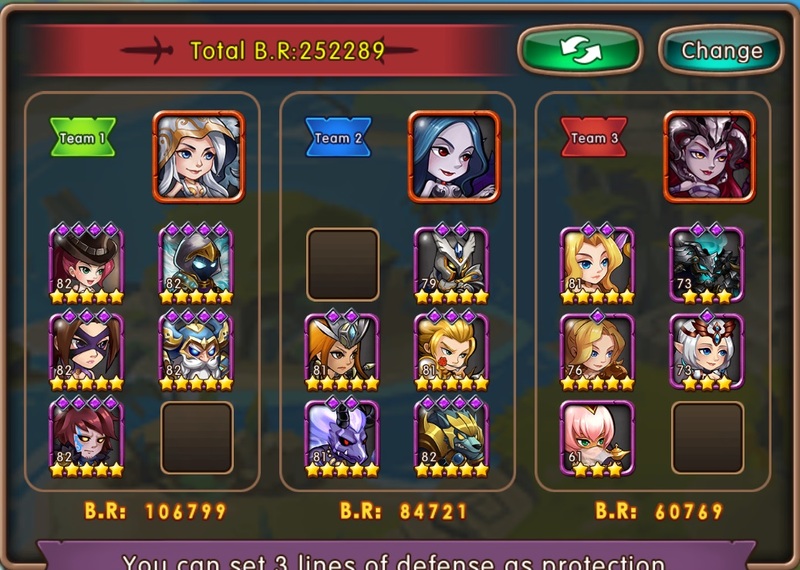 A defense team is consisted of 3 groups of 5 heroes and 1 angel each. Your Opponent has to defeat all 3 teams with the heroes and angels that he has. If you plunder and suffer defeat for 3 times, regardless if you have heroes left, You will be deemed as failed to plunder. In the Guild wharf, there are 2 different kind of ranking in which you will get rewards by achieving the ranks. By achieving the certain ranks, you will get rewards: Guild tokens, and Guild battle devotion. 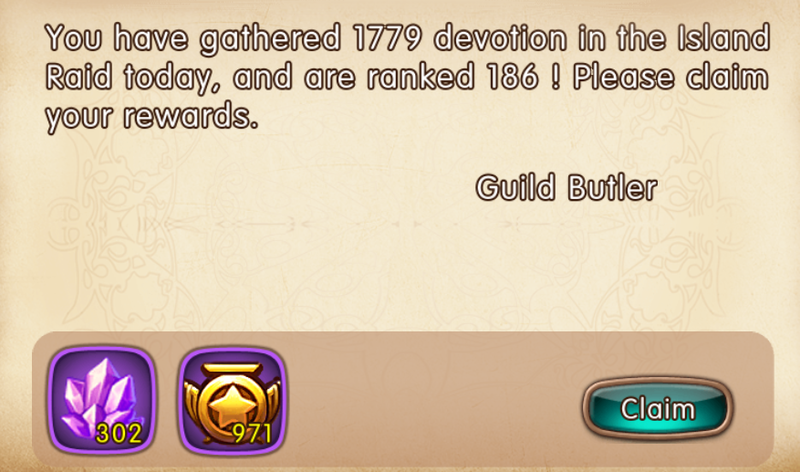 Next, you have an individual rank rewards, similarly according to ranks, you get Guild tokens and Guild Battle Devotion. 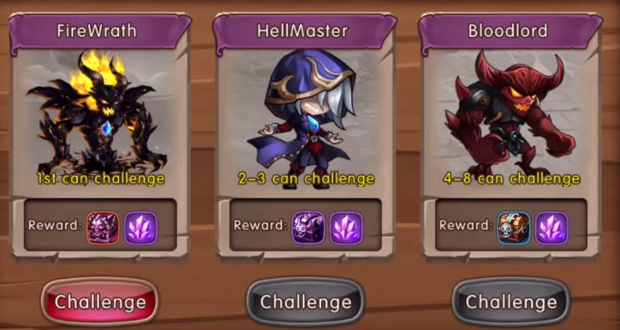 Your guild will be set at their daily ranks and you will get the chance to fight the bosses in the wharf for even more rewards. Note that their reward differs as well. For more details and closer look of and example of the FireWrath, Follow this youtube link and see how my guildmate and friend Hihaos on his fight with the FireWrath! And the opening of the Pandora chest by FireWrath! This are actually bonus gems chest that appears randomly and it appears every day in the wharf, so do check the wharf for additional gems and resources! Right before the war, the accumulated point that is ongoing into the new day will be taken account into the war day itself. 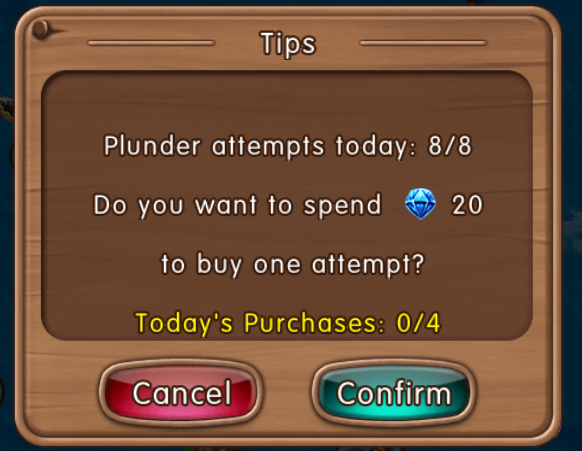 don’t overestimate yourself and lose and opponent in plunder! If there is any mistakes or updates do drop a post and I will edit it into this guide! any hero killed in battle cannot be used during that plunder. If you lose because of time the angel will not be available for the remainder of that plunder. Maybe we should copy this over to the wiki? I can only please one person at a time. Today is not your day. Sounds good to me Might need to be updated a bit though! I can get the article in place, then people can edit / update it as necessary. 2019-4-21 01:02 GMT+8 , Processed in 0.062314 second(s), 51 queries .